This site contains a lot of printable sudoku puzzles.You can print out free from your computer. Print unlimited Standard and samurai sudoku puzzles to PDF file. 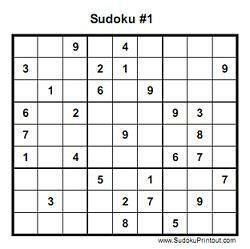 Copyright © 2008 SudokuPrintout.com, a sudoku website, All rights reserved.